My interest in Barfly started this past summer when I was first discovering new bars in Montreal by myself. 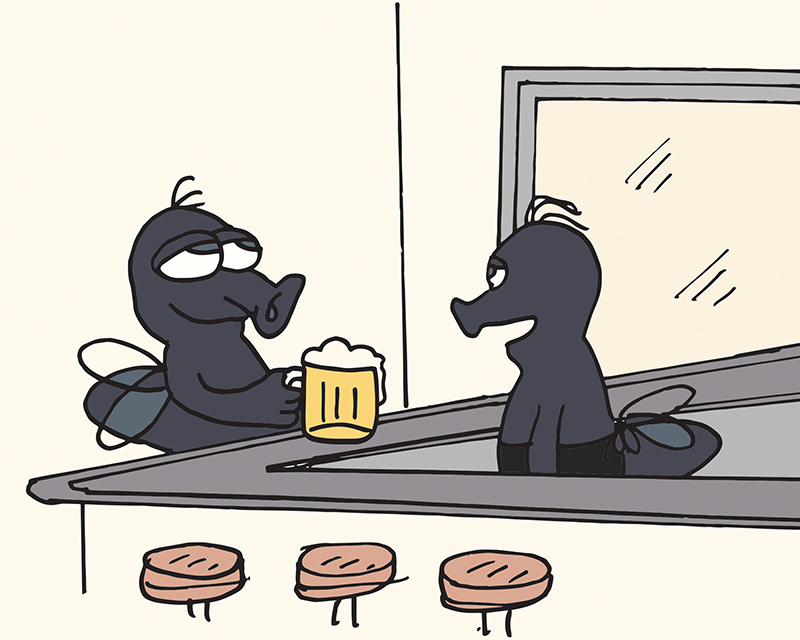 At a bar called Grumpy’s, I had a funny conversation with two strangers, who were brother and sister, about the definition of a barfly. Barfly (noun): a person who spends too much time drinking in bars. The brother recommended that I visit Barfly at least once, hailing it as the best dive bar in the city. I hadn’t planned on going to Barfly this Saturday night. Originally, I was headed off to my friend Sarina’s house, but it turns out I had mixed up the dates of her birthday party, so I made new plans. Earlier that week, I had seen a Facebook event for two bands who would be playing that night. Excited to hear some good live music, I decided to check out Barfly for a spontaneous rock-and-roll adventure. I got on a bus in front of St-Laurent metro and as I got off, I immediately spotted the bar right across the street. Not sure what to expect, I opened the door and went to sit in the middle of the bar. To my surprise, my Facebook friend Steve, who was playing drums that night, was sitting right beside me. He didn’t recognize me until I pulled out a pen from my purse and started drawing a picture of Pennywise the clown. After awhile, I noticed that there was another person engaged in creative work. Across from me, there was a bearded man writing and drawing in a sketchbook. Even though we never spoke a word to each other the entire night, seeing this like-minded individual made me feel less weird. I was happy to be sitting next to Steve since he always has interesting stories to share and he appreciates my talent as a visual artist. We talked about our addiction to tattoos and where he got the fork-shaped piece of jewelry that he was wearing. The funniest part of the night was when my English teacher, who taught me short fiction two years ago, showed up. He commented that he knew the author of the poetry book I was reading. It never ceases to surprise me how small social circles are in Montreal. When the second band of the night started playing, a quirky and drunk old man got up on stage and started dancing. When he got too carried away, his lady friend grabbed him off the stage and forced him to sit down. There was a moment when time seemed to slow down. I stopped watching the stage and looked around at the crowd of people who were nodding their heads along with the rhythm of the music. I felt like a fly on the wall, quietly observing the strange mix of people around me. Even though I was probably the youngest person at the bar, I felt a sense of belonging to this group of strangers who wouldn’t judge me. Everyone gathered there that night was longing for an alcoholic escape from the stresses of everyday life like me. At midnight, I decided to start heading home. I walked out into the night and spotted the drunk old man outside with his pants down peeing into the wind. A couple laughed at his exposed privates as they passed by. Spontaneous adventures like this night are important because they remind me that I can still have fun by myself. I seek comfort in going to bars alone to renew my sense of independence. Going to Barfly was a fun night filled with good music and quirky individuals.